What do you do with a leftover cheese and fruit tray from Sams Club? Make samosas! Because then it's different enough it's a brand new dish, instead of trudging through leftovers! 2 eggs, beaten, for an egg wash. Pull the puff pastry out and let it thaw. Crack eggs into a bowl, beat, and set by the chopping board. Chop everything that requires chopping, dump in large mixing bowl with all other filling ingredients. Either stir with spoon or just put on a pair of non-powdered gloves and mix by hand. Unfold puff pastry. cut on fold lines into 3 strips, and cut each of those into thirds, so you have squares of pastry. Roll out each pastry square until it's roughly twice original size, and add egg was in a sealing strip to two sides. Put filling in the middle, and fold the pastry over into a triangle packet, pressing to seal edges. When baking tray is full (remember, these expand when baking), brush the top of dough with egg wash.
Bake for 20 minutes. Silicone baking sheets very helpful here, so it doesn't stick. Easiest to start one tray, pop it in, then start the next tray. Pull out, let cool at least five minutes before eating. Makes 27 samosas, which is enough to use up the cheese of the cheese tray. Feeds at least 5 adults with no appetizer or side dish. 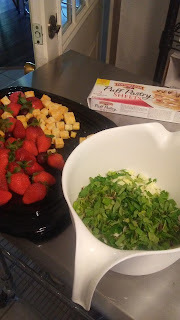 ...as for the leftover fruit, toss any past saving, then half or quarter the rest (removing any stems from grapes and the green bit from the strawberries.) Add a tablespoon (or two) of rum, half a teaspoon of vanilla, and mix well. Let sit for half an hour to soak, then fold into whipped cream. Serve as dessert.